Joy' 88 (left: used clothes) and Candywood (right: hats and accesories) where I bought a hat. 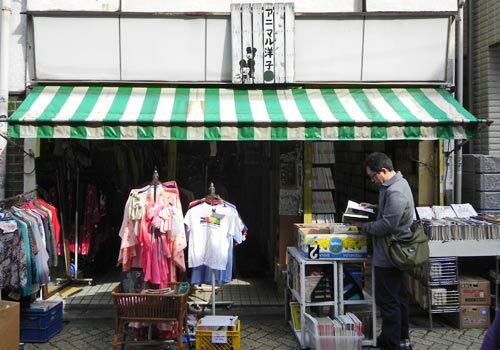 Animal Yoko (clothes including used ones and second hand books); the shop has the atmosphere of subculture or underground. This shop buys and sells used clothes. Many shops use the street for their display. Therefore, I went out on Sunday. I first visited our family grave, because I failed to visit it a week earlier on the equinoctial week as usual. Then, after visiting some places along the streetcar Arakawa Line, I went to Isetan Department Store in Shinjuku. I wanted to by a couple of things there, but when I entered Isetan, I felt ill in the awful crowd. I had expected a quiet store, because the media repeatedly reported that department stores were empty. Isetan might be an exception. But, it was really overcrowded with customers and I quickly escaped from there to inspire more oxygen. However, I did not go back home directly. I instead went to Koenji and strolled on "Look Street". Look Street is a traditional shopping street in Koenji which stretches over some 650m from JR Koenji station to subway Tokyo Metro Shin-Koenji station. 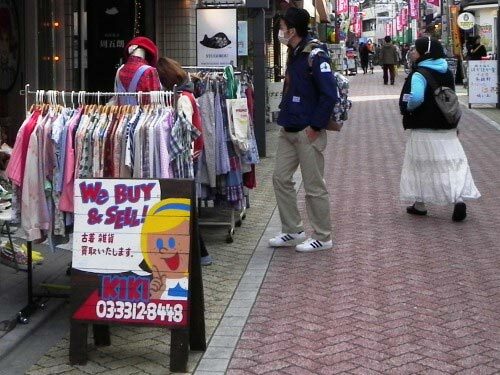 Koenji is now popular as a town of used clothes. 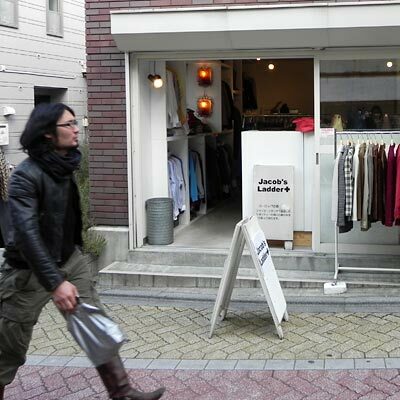 According to a research there are about 100 used clothes shops in Koenji. 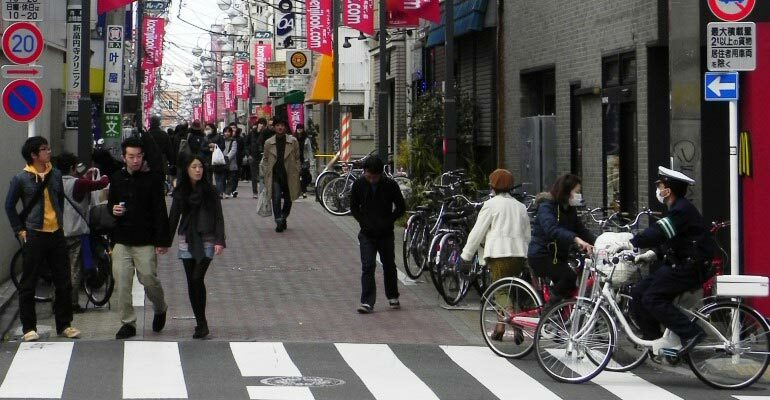 If we see Tokyo, apart from Koenji, there are also concentrations of used clothes shops in Harajuku and Daikanyama in Shibuya ward and Shimokitazawa in Setagaya ward. 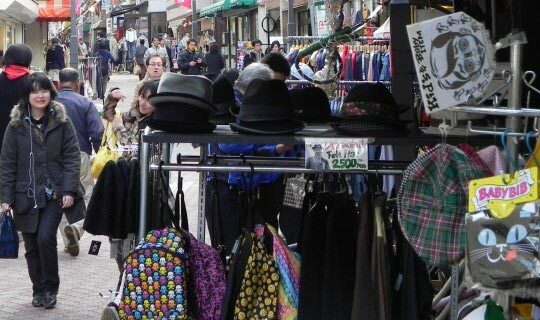 The characteristic of Koenji is the high ratio of used clothes shops among clothing shops and the best place to find used clothes shops in Koenji is Look Street. 25 used clothes shops are registered at the Look Shopping Street Association. Their clients are mostly young teenage girls and they sell not only domestic used clothes but also those coming from overseas such as Italy, France and US. Of course there are other kinds of shops: accessories, glasses, take out sushi, bags, tattoo, Japanese sweets and so on. There are also coffee shops, second hand book shops, shoe repair shops, restaurants as well as a funeral parlor. Jacob's Ladder is specialized in the imported second hand clothes from Italy and France. The JR station Koenji opened in 1922. Immediately thereafter the Great Kanto Earthquake occurred and in its aftermath many intellectuals, scholars and writers moved from the center of Tokyo to the newly developed residential areas along the Chuo Line. Look Street existed from that time as a typical local shopping street. 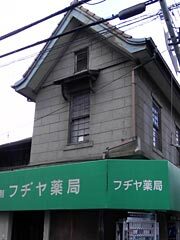 Fujiya Pharmacy has an old store house on top of the house. As it escaped from bombardment during WWII, there are still some old houses and shops along the street. In the 1960s and 1970s, the majority of the inhabitants in Koenji were young people. A study in 1970 shows that baby boomer boys and girls (born between 1947 and 1949) represented 24% and 19% of the total inhabitants. Including the whole twenties the figures are 38% and 31%. That was also the age of students' movements and Koenji still keeps the memory of that age. At the end of the 1970s, young people stopped talking about politics and singing folk songs; love songs instead of protest songs. They started enjoying "new music" playing tennis and ski and driving to Shonan beach. In the late 1980s when Japan was crazy in bubble economy, Koenji was totally out of the trend. In the 1990s the trend reversed again after the bubble burst. Newcomers, mostly young people, started to rent space and open shop in Look Street. They came here because rent was cheaper in Koenji compared with Shimokitazawa and Kichijoji and the initial cost for opening shops was smaller. I feel very comfortable in Look Street. It is not totally a town of young people. Old neighbors, both men and women, are strolling here as a part of their life. There are not many - only Seven Eleven and a few others - chain stores. It is a casual and natural place where people can relax. 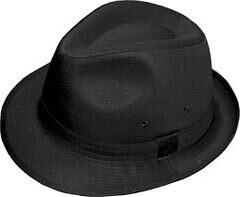 I bought a black felt hat at Candywood. Made in Korea and ¥4070. Shin-Koenji side entrance of Look Street. A policeman is on his patrol on a pedelec (right). Policemen have detailed information on the inhabitants in the area he is responsible for.